The RNAzol® BD Column Kit combines RNAzol® BD, with a versatile and universal column in one procedure. This Kit provides unsurpassed yields of either total RNA, large RNA (> 150 – 200 bases) or small RNA (< 150 – 200 bases) in separate fractions. RNAzol® BD has been used to determine that RNA averages 14 μg/ml of human whole blood and ranges from 6 – 22 μg/ml. These RNA levels are significantly higher than previously reported with other methods that average only 2 – 5 μg of total RNA per ml of human blood. This Kit allows for isolation of low RNA quantities without pellets and in about 60 minutes. The large RNA fraction includes long non-coding RNA, mRNA and rRNA. The small RNA fraction includes tRNA, small rRNA and microRNA down to 10 bases. The Kit allows for simultaneous isolation of RNA and DNA from the same sample. The pure and undegraded RNA is ready for RT-PCR without DNase treatment. 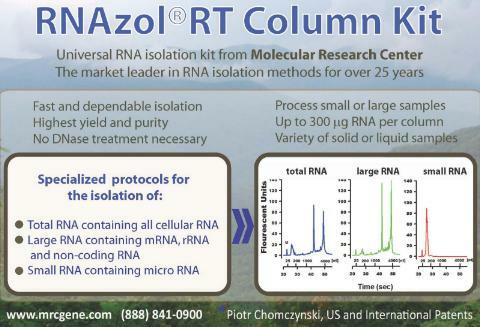 RNAzol® BD Column Kit isolates pure and undegraded RNA from whole blood, plasma or serum of human or animal origin.